Founded in 1982, Microscan has a strong history of technology innovation which includes the invention of the first laser diode barcode scanner and the 2D symbology, Data Matrix. 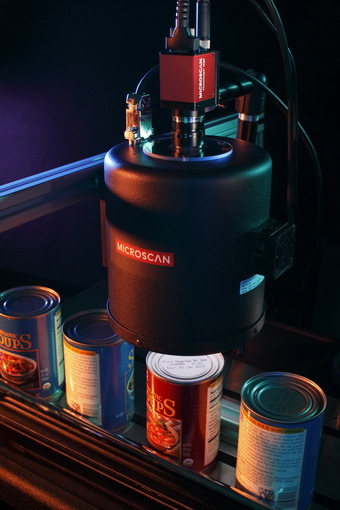 Today, Microscan remains a technology leader in automatic identification and machine vision with extensive solutions for ID tracking, traceability and inspection. Sensor Options: Progressive scan, square pixel. Powerful Capabilities: Features a robust tool set to address a wide range of automation challenges using vision technology. Combined with patented liquid lens autofocus, the Vision HAWK can easily cover almost any vision or barcode application. Advanced Optical System: High resolution modular optical zoom system enables the Vision HAWK to inspect objects and labels at distances from 33 mm to 2 m and beyond. 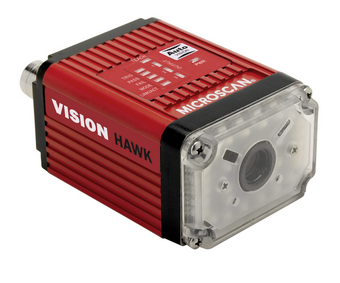 Rugged Design: The Vision HAWK features a rugged industrial design with a cast alloy IP65/67 enclosure and M12 connectors. Integrated Ethernet protocols are included for high speed communication. Microscan holds one of the world’s most robust patent portfolios for machine vision technology, with software solutions to accommodate all user levels and applications. AutoVISION™ features an intuitive interface for easy setup and deployment of vision applications, including scalability to Visionscape® for more complex configurations and advanced programming capabilities. Complete Tool Set: AutoVISION includes Microscan’s powerful X-Mode decoding capability for 1D and 2D symbol reading along with trainable font-based OCR. For inspection and control applications AutoVISION includes simple yet powerful Locate, Measure, Count and Presence/Absence Tools. Decode and OCR Tools include links to match string input from serial or TCP ports. Easily validate the quality of printed text such as date/lot codes with Verification and OCV Tools. Intuitive User Interface: Features an intuitive user interface that guides the user to connect to a device, configure the hardware, program the job, and monitor results. Upon start up, it automatically detects all compatible devices and immediately begins configuration. Or use in ‘emulator’ mode with stored images on a PC. systems. A connection to a PLC system can be created by simply clicking a “Link” button on the desired parameter to connect it. Scalable with Visionscape: For applications demanding more flexibility or configuration options, easily upgrade to full functionality of Visionscape®, Microscan’s machine vision platform for both smart camera and PC-based systems. AutoVISION jobs can be opened with Visionscape FrontRunner enabling scripting and other advanced programming capabilities. Multi-Language: Easily switch the interface between English, German, and Chinese languages. Auto ID Tools: Decoding all standard linear barcodes, Data Matrix, and other symbols, Optical Character Recognition (OCR) and Verification (OCV), etc. Image Processing Tools: Image arithmetic, image rotation and warping, binary and grayscale morphology, edge enhancement, other image filtering, etc. Image Analysis Tools: Flaw detection, histogram analysis, blob analysis, template and pattern recognition, object location and orientation detections, etc. Calibrated Dimensional Measurements: Variety of pre-configured measurements such as line intersection, point-to-point distance, point-to-line normal, etc. Intellifind Tool: Geometric pattern match tool for robust pattern location and pattern recognition in noisy images; includes scale measurement. Color Support: Color imaging, color visualization and other color tools allow color checking and identification applications. Color-based dimensional gauging applications are also possible. Application Specific and Custom Tools: User-defined expressions and math, custom scripted vision processing tools, etc. FrontRunner: FrontRunner engineering user interface enables quick and easy creation of complex vision applications that can be run on PC-based systems or downloaded to a smart camera, depending on specific application needs. AppRunner: In the AppRunner standard runtime interface, the user is provided with complete system status, with abilities to start/stop the application, collect and review failed images, and present other diagnostic information. Open ActiveX: A complete set of ActiveX components allow the creation of custom user interfaces and creation of vision applications on the fly. Customization: From operators on the factory floor to application engineers and developers, Visionscape software offers a configuration environment that can be tailored to different users for maximum productivity. 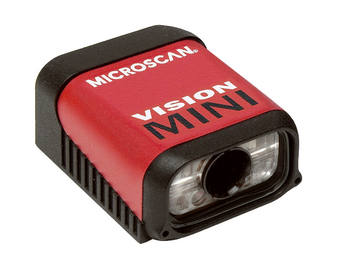 Microscan has over 20 years of reliable performance in machine vision lighting. Microscan’s NERLITE machine vision lighting products are designed to meet the demands of industrial automation environments, and enable machine vision and auto ID systems to perform reliably in thousands of diverse applications worldwide. From standard lighting products to embedded applications to customized solutions, Microscan solves the most challenging machine vision lighting problems with a broad range of NERLITE illumination sources. A team of expert innovators evaluates each application and configures NERLITE products to meet the toughest challenges. NERLITE technology has the flexibility to meet your requirements. Smart Series DOAL (Diffuse On-Axis Light) illuminators provide diffuse, uniform illumination for flat specular surfaces. With the coaxial lighting approach, specular surfaces perpendicular to the camera appear bright, while surfaces surfaces which are marked or embossed absorb light and appear dark. By providing greater uniformity than conventional sources, DOALs increase machine vision accuracy and repeatability. CDI (Cloudy Day Illuminators) provides self-contained continuous diffuse lighting performance. It is designed for critical applications involving inspection of highly faceted and undulating reflective surfaces, such as CD artwork verification and the inspection of solder patterns on circuit boards. CDI illumination allows products to be inspected in the package, including blister-packaged pharmaceutical products and computer chips inside a clear packaging tube. Provides good contrast over large areas to perform product inspection. Smart Series HI-BRITE large area LED vision lighting provides a high intensity output, featuring IP67 industrial sealing and the brightest LEDs in their class. The compact lights include a built-in controller for a complete and easily integrated solution for rugged automation environments. Versatile 10° spot and 50° flood lens options allow them to be used at both near and far distances to accommodate a variety of applications. Smart Series ring lights are a cost-effective, easily integrated solution for diffuse illumination of surfaces. With subtle adjustments to working distance and angle of light delivery, ring lights can deliver good image contrast for a minimal investment. Packaging and mounting advancements put the emphasis on durability and versatility for use in any lighting application. An Area Array’s general purpose, unidirectional design (adjustable via mounting position) may be used for dark field (creating shadows and specular reflection) or for bright field lighting for diffused surfaces. As with other incident lighting choices, subtle adjustments to working distance and angle of light delivery can deliver good image contrast for minimal investment. Image captured shows high contrast Data Matrix symbols. adjustments to working distance and angle provide good image contrast on diffused surfaces. Models for continuous or strobe operation support static or high speed applications. Dome illuminators are an economical source of diffused, uniform light. Their large, solid angle of illumination supports imaging of curved, shiny or bumpy surfaces. They are a cost-effective alternative to NERLITE CDI illuminators for applications not requiring an on-axis lighting component. The Edge to Edge Backlight Series provides sharp contrast to outline a part’s shape, find edges and view openings such as drilled holes. High intensity and uniformity are packed into a low-profile industrial package providing optimal thermal management of the LEDs. The lighting design provides the unique ability to mate multiple lights to provide larger illuminated areas. Our 2D fixed-mount readers feature the latest imaging technology for decoding both 2D symbols, such as Data Matrix, and linear barcodes. Specialty readers are available for high speed reading, ESD-sensitive applications, and decoding the most challenging direct part marks (DPM). The MS-4 barcode imager is designed specifically for embedded barcode applications. Currently the world’s smallest high resolution barcode imager, the MS-4’s ultra-compact size and wide angle optics provide the widest field of view available for reading any symbol at close range. It is the ideal barcode imager for OEM design engineers who need to read 2D symbols in tight spaces with 100% data integrity. Compact & Lightweight: The MS-4 is the world’s smallest high performance barcode imager. Its small form allows flexible positioning in tight spaces. The lightweight and durable magnesium alloy case weighs less than 2 oz. Wide Field of View: The MS-4 has an extremely wide field of view and reads linear codes or 2D symbols as close as 1” (25 mm). Omnidirectional Reading: Linear codes or 2D symbols can be decoded in any orientation. The MS-4 removes the restriction of planning for laser line alignment. Mounting Flexibility: The MS-4’s compact size, right angle mirror option, and corner-exit cable conserve cubic space to create the tightest fit possible within instrumentation and equipment. The MS-4X features ultra-compact size and wide angle optics to provide the widest field of view available for reading any symbol at close range. Aggressive decoding is ensured through X-Mode technology, which reads direct part marks and damaged or difficult symbols with no configuration or setup required. High performance, flexibility, and advanced decoding make the MS-4X the ideal imager for reading difficult codes in tight spaces. X–Mode Technology: Our patented X-Mode technology provides easy setup and deployment of the MS-4X in any application. In addition to reliable decoding of damaged or difficult linear codes and 2D symbols, the MS-4X features advanced decode algorithms to read a wide range of direct part marks. Compact & Lightweight: The MS-4X is the world’s smallest high performance imager. Its small form allows flexible positioning in tight spaces. The lightweight and durable magnesium alloy case weighs less than 2 oz. Wide Field of View: The MS-4X has an extremely wide field of view and reads linear codes or 2D symbols as close as 1” (25 mm). Mounting Flexibility: The compact size, right angle mirror option, and corner-exit cable of the MS-4X conserve cubic space to create the tightest fit possible within instrumentation and equipment. EZ Trax™ Option: Image capture and storage software provides tracking of symbol images. The MS-4Xi features ultra-compact size and wide angle optics to provide the widest field of view available for reading any symbol at close range. Aggressive decoding is ensured through X-Mode technology, which reads direct part marks and damaged or difficult symbols with no configuration or setup required. Easy setup and advanced decoding make the MS-4Xi the ideal imager for reliable reading in almost any automation environment. X–Mode Technology: Our patented X-Mode technology provides easy setup and deployment of the MS-4Xi in any application. In addition to reliable decoding of damaged or difficult linear codes and 2D symbols, the MS-4Xi features advanced decode algorithms to read a wide range of direct part marks. Compact & Lightweight: The MS-4Xi is the world’s smallest high performance imager. Its small form allows flexible positioning in tight spaces. The lightweight and durable magnesium alloy case weighs less than 2 oz. Wide Field of View: The MS-4Xi has an extremely wide field of view and reads linear codes or 2D symbols as close as 1” (25 mm). Mounting Flexibility: The compact size, right angle mirror option, and corner-exit cable of the MS-4Xi conserve cubic space to create the tightest fit possible within instrumentation and equipment. With easy setup, powerful image processing, and multiple configurations, the MINI Hawk is an ideal solution for any barcode or DPM application. X–Mode Technology: Our patented X-Mode technology provides easy setup and deployment in any application. In addition to reliable decoding of damaged or difficult linear codes and 2D symbols, the MINI Hawk features advanced decode algorithms to read a wide range of direct part marks. Autofocus: For real time dynamic autofocus, position the symbol at the center of the field of view, and push the EZ button. 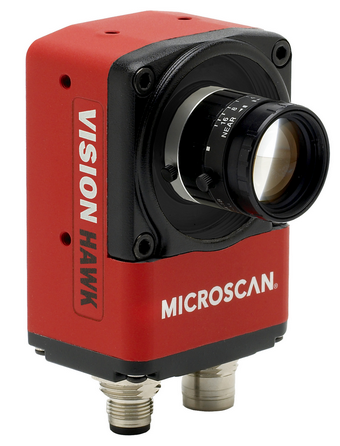 The MINI Hawk automatically adjusts focal distance and sets internal parameters to optimize the symbol. Flexibility: Mulitple resolutions are available to provide solutions to a wide range of applications. Wide Field of View: Read symbols as large as 2” (50.8 mm) square as close as 1” (25.4 mm) with diffractive field illumination and optional right angle mirror. The QX Hawk is the world’s first imager to be fully integrated with liquid lens technology, enabling infinite focus flexibility. Bridging the gap between ease of use and performance, the QX Hawk features a high resolution modular optical zoom system, aggessive X-Mode decoding, and simple plug and play connectivity. 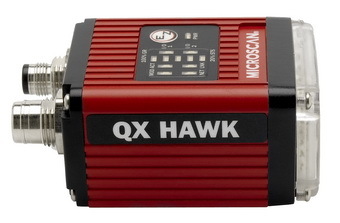 The QX Hawk imager easily reads any barcode or 2D symbol, including challenging 2D direct part marks (DPM), in any environment, within seconds of installation. Advanced imaging technology includes a high resolution modular optical zoom system that enables the QX Hawk to read marks at distances from 20 mm to 2 m and beyond. 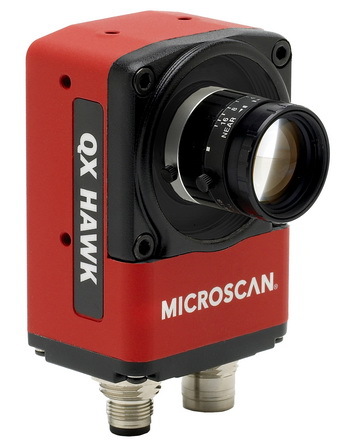 Combined with patent pending liquid lens autofocus, the QX Hawk can easily cover almost any auto ID application. Using best-in-class X-Mode decode algorithms, the QX Hawk consistently captures everything from low contrast, damaged, or otherwise challenging direct part marks, to a high density 3.3 mil Data Matrix, to a very large linear barcode. The QX Hawk is powered by a dual core ARM/DSP processor to allow both high speed image capture and real time configuration and communication. The embedded processing, combined with three high speed inputs/outputs directly from the reader, enable the QX Hawk to provide line level control functions. The DPM Verifier (for Direct Part Marks) is a UID Compliance Verifier that evaluates and verifies symbols according to specifications in MIL-STD-130 and DFAR 252.211-7003. 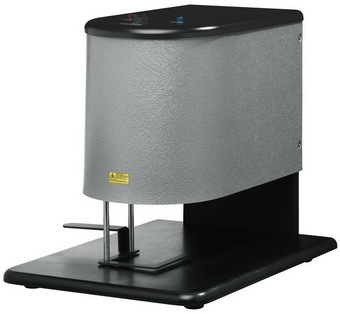 The DPM Verifier is designed to analyze and verify Data Matrix symbols that are directly marked by dot peen, laser etch and chemical etch on materials such as metal, plastic, and rubber. UID Compliance Verification products allow U.S. DoD (Dept. of Defense) suppliers and subcontractors to easily and consistently comply with a wide range of UID regulations. Flexible Mounting: For maximum flexibility within any application or workspace, the DPM Verifier can be used as a standalone desktop unit, portable verifier or mounted to an optional stand. Direct Part Marks: The DPM Verifier is designed for validation and verification of UID Data Matrix direct part marks with a variety of shapes and sizes. A variety of lighting options provide the necessary compliance for testing UID data syntax strings and evaluating symbol quality. Reports: The DPM Verifier includes reporting features with quality assurance and repeatable/ auditable results. Reports are detailed, and verification results are archived for backup and compliance audits. UID Compliance: Since implementation of the UID inititative, most goods destined for the U.S. DoD must be permanently marked with a UID code. UID Compliance Verifiers enable the DoD and their suppliers and subcontractors to meet the requirements in UID standards such as MIL-STD- 130 and DFAR 252.211-7003. The LDP Verifier (for Labels and Data Plates) is a UID Compliance Verifier that evaluates and verifies symbols according to specifications in MIL-STD-130 and DFAR 252.211-7003. The LDP Verifier has been specially developed for checking and verifying UID Data Matrix markings on labels and data plates. Labels and Data Plates: The LDP Verifier is designed for verification of labels and data plates with thickness up to 0.125 inch (3.17 mm). 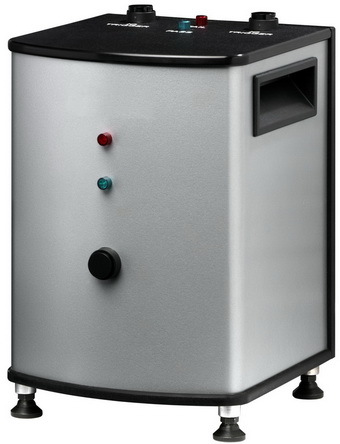 Integrated Design: The LDP Verifier is a standalone unit, connected to a host PC, that contains appropriately fixed lens and lighting systems required for testing UID data syntax strings and evaluating symbol quality. Reports: The LDP Verifier includes reporting features with quality assurance and repeatable/auditable results. Reports are detailed, and verification results are archived for backup and compliance audits. Laser barcode scanners are ideal for applications that require high speed reading of linear codes or stacked symbols. From small products for embedded OEM applications to rugged laser barcode scanners for industrial use, Microscan offers a wide range of quality products to read linear barcodes and stacked symbols, with features such as high speed reading, wide field of view, symbol reconstruction, and aggressive decoding technology. CLICK HERE to view a comparison chart of our Industrial Laser Products. The QX-830 industrial barcode scanner combines revolutionary flexible connectivity with high performance decoding capabilities to reliably read 1D barcodes in almost any automation environment. In addition to the Quick Connect System and X-Mode Technology, the QX-830 features IP65 industrial sealing and optional embedded Ethernet protocols. High performance, simple connectivity, and IP65 enclosure make the QX-830 an ideal industrial barcode scanner for any industrial application. The QX-870 laser scanner partners the latest technologies in barcode reading and connectivity into an easy to use solution for barcode track, trace and control applications. Simple to set up and deploy, it features a programmable sweeping raster to read multiple codes, in varying locations, even if they are damaged or misaligned. With plug and play setup, IP65 industrial sealing, and the most aggressive decode algorithms available, the QX-870 an ideal laser scanner for any industrial application. High Performance: Aggressive decoding capabilities allow reliable reading of barcodes out to 30” (762 cm), at up to a 10” (25.4 cm) beam width. © Copyright 2012 by Axmatic. All Rights Reserved.